These are a few of my favorite things………….. yes, that famous line from a favorite song comes to mind as I finally return to the Ecclesiastical Sewing workroom. It seems like ages since I have had a chance to spend time working on projects or even spend time in the workroom. Last fall saw a six-week period where everything was moved out of the workroom in preparation for a major remodel. The timing was a challenge: everything started four weeks before our daughter’s wedding. But survival is assured with a good sense of humor, and a firm determination to roll with whatever may come. Thankfully, all went well. The remodel was completed one week before the wedding. The bare basics were quickly restored to allow for daily life to resume. Order was restored to pull final details together for the wedding. The January Winter Day was beautiful, as was the wedding, and the festivities which followed. It was a special way to begin a brand New Year. Ah, but back to my favorite things. One of the most challenging parts of having a house disrupted with a remodel is the (temporary) removal of one’s favorite things. The list of favorite Ecclesiastical Sewing things would be the lovely liturgical fabrics and trims, vestment patterns and pattern drafting tools, and sewing machines. There would be embroidery hoops and floss, and goldwork threads. Yes, I have missed all of these things. But I think the things I have missed the most would be…………..books. Yes, vintage church vestment books. My Ecclesiastical Sewing and church vestment books have been the things I have missed the most during this transition stage. Late at night when the house is quiet, the best part of the day is enjoying a few quiet moments looking at pictures or reading about techniques from my library of church embroidery and church vestment books. Thankfully, most books have been restored and many are now housed in a lovely glass front book case. There are a few favorite books still buried in boxes in the frigid garage, waiting for a day warm enough to permit their return to the vestment workroom. This weekend may not be the best timing for outdoor work in the garage, but the cold cannot last forever, even in Northern Minnesota. There are some new acquisitions to my library which I am excited to share, once things are in order enough to get the camera out. 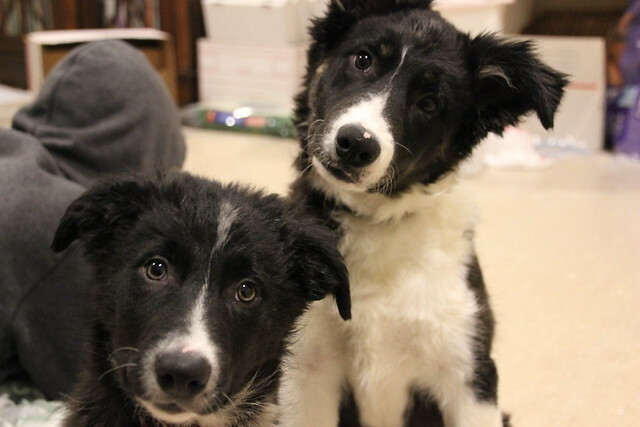 For tonight, I must also tend to some new soon to be favorite things: Onyx and Shelby, 4 and 3 month old border collies. They are not permitted in the workroom, but in time, when they learn some manners, they will become my late night sewing companions, as was their predecessor. Carrie, I understand you do sewing of church related projects. I have a deaconess stole that needs to be converted to a pastoral stole. I am being ordained at the end of April. I live in Illinois. I will be glad to mail it to you for the alternations. Thank you for your inquiry. I do church related sewing for my own parish, and for my projects which are related to my soon to open online store where I will have fabrics and patterns for those interested in making vestments. I also manage and run two other family businesses, so regretfully,I am not able to take on private commissions at this time. I hope as time goes on to develop relationships with some of my readers and those following the blog who might be interested in making vestments for others. As those contacts are developed, I will be sure to share. I wish you the very best with your upcoming ordination.